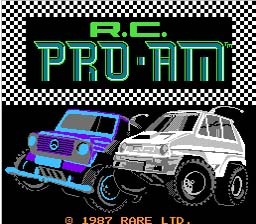 RC Pro AM 1987 By: Rare Ltd.
Race your R.C. car to the head of the pack of highly competitive drone cars. Push it to the limit on every corner as your tires squeal and you jockey for position to take the lead. Increase your car's performance with "turbo," "top speed," and "sticky tire" items found on the race courses. Look for missiles, bombs, and bonus letters while avoiding water and oil hazards. 32 exciting R.C. tracks and a vadety of car types await your challenge. --From the NES RC Pro AM instruction manual. Play RC Pro AM Now! You are a radio-control racecar driver, your goal is to place in the top three of every race to win the trophy and prize money. This game is pretty cool and fun, I must admit, even though it can be a little frustrating as well. The first thing you need to remember is that it's a Remote Control race, which means that your steering is always relative to you car's current position, not which way you want to go on the screen. After you've got this worked out in your head you should be okay. There are lots of stuff to pick up, like sticky tires to improve handling, engine upgrades to boost top speed, and turbo drives to enhance acceleration. Also there are Bombs and Missiles to blast your rivals into smithereens. As you may intuit, missiles fire forward to take out anyone presumptuous enough to be in front of you, and bombs drop behind you to chastise any driver who makes so bold as to try to pass you. Unfortunatly, you can't have both, so when you pick up bombs your entire stock of missiles will be changed to bombs and vice-versa. Also there are glowing letters on the track which you use to spell out N-I-N-T-E-N-D-O. When you collect all the letters you get a cool new vehicle which is supposed to be better than the one you started with but I'm not so sure. In any case the opponents get upgraded too, so it seems to be a bit of a moot issue. Also, this game is notorious for cheating, i.e. your rivals will suddenly become speed demons and catch up from impossible distances behind you. So don't get cocky, your lead is never secure! The race ends when the first car crosses the finish line, regardless of how far behind the other cars might be. In any other race you would have the opportunity to improve your standing by overtaking another driver or two, since a real race doesn't end until everybody finishes. However in this case, assuming you aren't in first place, you may need to do something desperate just before the checkered flag waves.